What’s Your “Peace of Mind” Worth? Since the first RV was invented, the management of the RV’s weight has been the most discussed, cussed, debated, and important topic wherever RVers gather. It is certain that virtually every RVer has had some first-hand experience (often bad), or will have heard of fellow RVers' issues and concerns related to weight and load management. 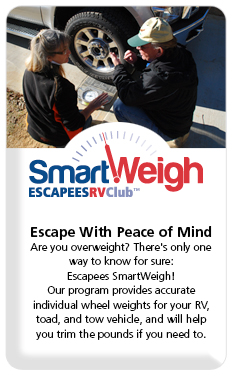 With this reality in mind, the Escapees RV Club developed the SmartWeigh RV safety program to educate RVers about this critical topic and to provide high quality, highly accurate, RV weighing opportunities at RV rallies, events, and at permanent weighing sites around the country. This vital program represents one of the most valuable of your club’s member benefits. SmartWeigh provides accurate individual wheel weights for your RV, toad, and tow vehicle. It also provides a complete weight analysis, which gives the RV operator critical RV weight safety and load management information in a highly usable (and understandable) format. For trailer-type RVs, it also includes a complete hitch adjustment analysis not available elsewhere and assuring this final critical step in RVing safety. The free SmartWeigh RV load management seminar, "Easy on the Asphalt by SmartWeigh," covers RV weight ratings terminology, RV tire safety, and addresses many of the misconceptions about RV weight ratings. 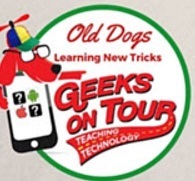 It is a must-attend training opportunity for all RVers, and is especially essential for new RVers or folks in the process of selecting and purchasing an RV. Don't make a costly mistake! Learn about this vitally important subject before you purchase your first (or next) RV! The SmartWeigh training seminar and RV weighing will be available Oct 4 at your upcoming rally. Please sign up for weighing by email at gaylordcoston@epix.net . Note: RVs are weighed by appointment, very efficiently during departure, and you will be on your way without delay. Additional weighing opportunities may be available during the rally.